Guess who? 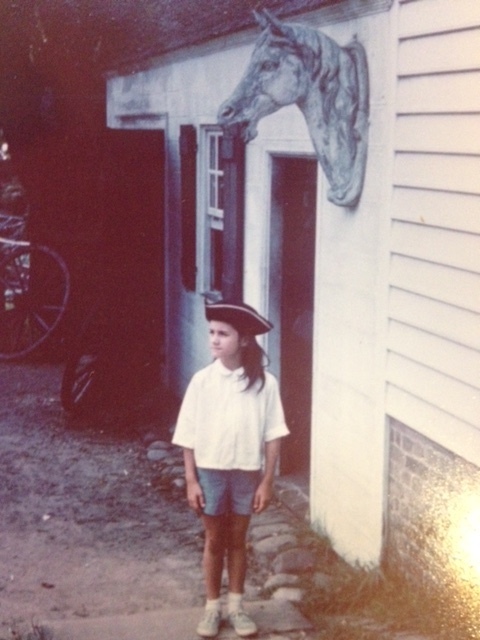 That’s six year-old me visiting Colonial Williamsburg for the very first time. I will never forget that Independence Day when my parents drove us halfway across the country to give kids from Kansas City the experience of being in one of the original thirteen colonies. Now that I’ve become a Connecticut Yankee, being surrounded by remnants of the Revolutionary War doesn’t seem quite as exotic as it once did. That’s not to say I feel jaded by the antiquity. I’ve grown to love this holiday more than any other and feel privileged to watch fireworks from my street which was once an 18th century gun battery. As I see the rockets launched from a barge on the Long Island Sound, I think of how they dug up cannonballs when they built this house. Little did I know that summer when I became infatuated with my three cornered hat that I would someday live where all the action took place. HAPPY BIRTHDAY AMERICA! 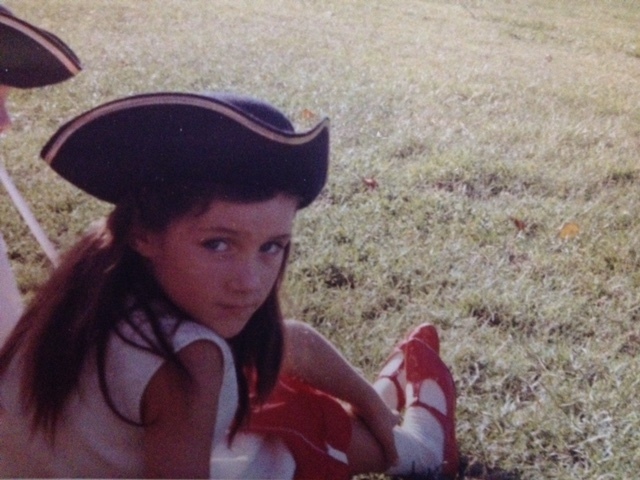 When I was in first grade, my parent’s decided that we should spend July 4th in the tradition of our founding fathers. Mom and Dad packed up our station wagon and drove off on a pilgrimage from Kansas City to Williamsburg and Jamestown, Va. After three days of “Are we there yet?” and many pit stops, we arrived in the magical land of three cornered hats. At least, that’s how I saw it… Oh there were lots of neat carriages, cannons and drums but I was most intrigued with the black, felt “tricorne” worn by everyone from the docents at Governor’s Palace to the proprietors of the gingerbread bakery. Once inside the souvenir “shoppe”, the salesperson in an eighteenth century costume tried to convince Mom to buy a lacy Martha Washington bonnet for me… No way!!! There wasn’t a single kid running around the streets of Williamsburg in one of those. Like all the other girls in the store, I picked out the hat with gold braid trimming the edge. It became inseparable from my head for the rest of the summer. I wore it in restaurants, at church– even to the swimming pool (much to the chagrin of my parents) Before the first day of school, my hat mysteriously disappeared. It was nowhere to be found in the house? For most people, fireworks are synonymous with July 4th. 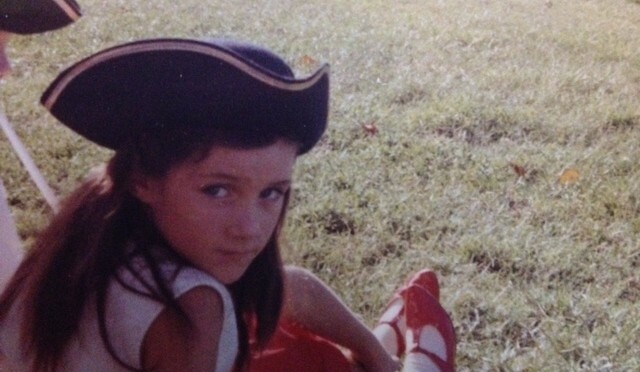 For me, I will always associate the the holiday with that wonderful trip to Williamsburg and my three cornered hat. 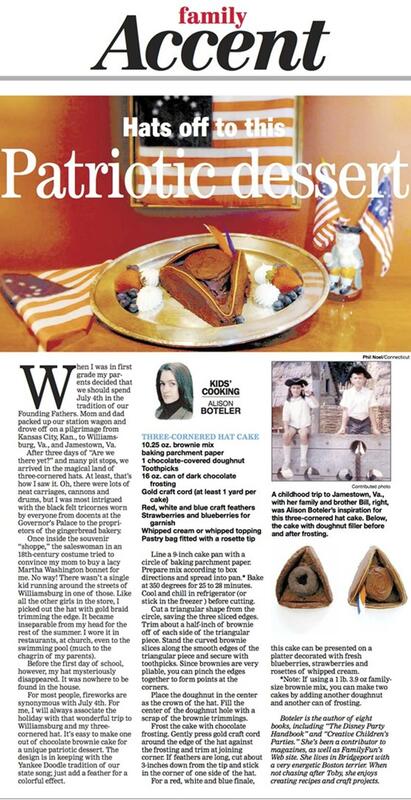 It’s easy to make one out of chocolate brownie cake for a unique patriotic dessert. In keeping with the Yankee Doodle tradition of our state song, ad a feather for a colorful effect. Line a 9” cake pan with a circle of baking parchment. Prepare mix according to directions and spread into pan*. Bake at 350 degrees for 25 to 28 minutes. Cool and chill in refrigerator (or stick in the freezer ) before cutting, Cut a triangular shape from the circle, saving the three sliced edges. Trim about another half inch of brownie off of each side of the triangular piece. Stand the curved brownie slices along the smooth edges of the triangular piece and secure with toothpicks. Since brownies are very pliable, you can pinch the edges together to form points at the corners. Place the donut in the center as the crown of the hat. Fill the center of the donut whole with a scrap of from the brownie trimmings. Frost the cake with chocolate frosting. Gently press gold craft cord around the edge of the hat against the frosting and trim at joining corner. If feathers are long, cut about 3” down from the tip and stick in the corner of one side of the hat. This cake can be presented on a platter decorated with fresh blueberries, strawberries and rosettes of whipped cream for a red white and blue finale. *Note, if using a 1 lb 3.9 oz family size brownie mix, you can make two cakes by simply adding another donut and can of frosting.